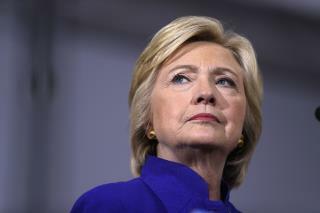 (Newser) – The FBI released another 189 heavily redacted pages from its investigation of Hillary Clinton's emails Friday, and Politico reports that they reveal that President Obama used a fake name when emailing Clinton. The FBI files state that during an interview, Clinton aide Huma Abedin was surprised to be told the name on an email was an Obama alias. "Once informed that the sender's name is believed to be pseudonym used by the president, Abedin exclaimed: 'How is this not classified?'" the report says. "Abedin then expressed her amazement at the president's use of a pseudonym and asked if she could have a copy of the email." In other developments"
The dozens of interviews summarized in the FBI files include a June interview with Romanian hacker "Guccifer," aka Marcel Lazar. He told the FBI that he had been lying the previous month when he told Fox News he broke into Clinton's server. A federal judge has ruled that most of the Clinton emails recovered during the FBI investigation don't need to be released until after Election Day, the Wall Street Journal reports. Judge James Boasberg ordered the release of 1,050 pages in three batches by Nov. 4, leaving what could be as many as 9,000 more pages to be released at a later date. GOP lawmaker Jason Chaffetz says three Clinton aides—including former chief of staff Cheryl Mills—were given immunity deals as part of the investigation. "No wonder they couldn't prosecute a case," Chaffetz, chairman of the House Oversight Committee, tells the AP. "They were handing out immunity deals like candy." A Clinton campaign spokesman accused Chaffetz and other House Republicans of "trying to make something out of nothing." The Washington Post reports that another Clinton aide granted immunity was Bryan Pagliano, who set up and maintained her private email server. He told investigators that State Department officials told him in 2009 or early 2010 that they were concerned about a "federal records retention issue" with the private server. He said Mills told him that Clinton predecessors including Colin Powell used similar systems. I have it from a reliable source that his pseudonym was . . . wait for it . . . "Chocolate Thunder"
Obama was also aware of Hillary's secret settup...no surprise here. Normally one person involved gets immunity so information can be collected to indite the rest of the criminals. Here, they were all basically let off the hook completely. What a complete crock. You can see what direction half of our country is leading us...democrats even screwed over their own Bernie voters to get this traitor elected.